Another fully-detailed room, based on room 31 of level 1 of The Dungeon Under the Mountain, but usable anywhere you like, of course. 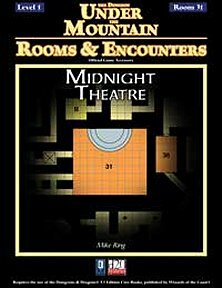 Publisher's blurb: "The trap door opens, dim light flickers and unearthly shadows bounce and reflect from every angle and you're immediately assaulted by the foul stench of ancient rotting blood. "A faint creaking sound comes from the ceiling above. At the tunnel's end is an empty suit of armor posed with its arms swept toward the entrance as though welcoming you in with a bow. The corridor leads to a large room scattered with fragments of brass horns and other instruments. Only the enormous pipe organ opposite the entrance has escaped destruction. "Above its vast and varicolored keyboard, long pipes crawl in a twisted mass toward the ceiling. To the north is a semicircular mural surrounded by a ring of splinters that were once chairs."